Featured on VentureBeat and BitMob! Bitmob.com was a suggestion from Chris Kohler actually (that wasn’t even a joke, I swear I will stop saying his name) that I had never heard of before. Community writers populate the website with content and editors of the site go through and pick their favorites of the day to put on the front page. They’re also partnered with VentureBeat which has a sub-community/page called GamesBeat that gets the same features. SO! I’m on two sites! I’ll save you the time of reading it by saying the content is nothing new, but they did edit the beginning a bit for clarity, which is a really good point for me to take away (i.e. always making descriptions and set ups as clear as possible). Anyway, again, just wanted to share for a minute. It’s probably a lot less important than I’m making it, but at the same time, it feels pretty gratifying, since I’ve applied to about a dozen jobs and haven’t even heard back from any of them, that’s how far away from achieving my goal I feel. So this is a small victory, in the small bout of failure I’ve been in. Woot! Bottom line: if you want to get published about games stuff, try bitmob.com! I’m in such a good mood, I won’t even pretend to keep this to myself. Hardy har har, what a clever title. I actually really enjoy the novel, Catch-22. But the point is that the game Catch-22, a puzzler that was one of the PAX10 (ten indie games selected by a panel as the best indie games at PAX), is truly delightful. I am notoriously bad at puzzle games. I talk about how bad I am at them all the time. I googled my way through many spots of Portal, I watched a lot of YouTube videos for Braid levels, I am basically the worst. Hell, I even looked up how to get through a couple spots in the A Book of Unwritten Tales demo I played. Perhaps the worst part is that I don’t even feel bad about the internet searching I do for answers and experiences that aren’t my own. So for me to play a puzzle-type game (maybe more a strategy game? I’m not sure what genre to put it in exactly) and then get really hyped for it is notable. Built by a three-man team that started the development company Mango Down, Catch-22 features a green ball and a blue ball circling a pink sphere in opposite directions. You first control the blue ball as you jump over the green ball to collect gold coins hovering above the pink sphere’s surface. Once you collect all the gold coins (which increase in number with every level you pass), you swap to controlling the green ball and have to collect the same gold coins which then reappear. The catch (HEY-O!) is that the blue ball remembers the exact trajectory it took while you tried to collect all the gold coins the first time. So you have to dodge its jumps, and collect coins. After you move back to the blue ball, the green ball remembers its most recent path, so on and so forth. It’s a total brain bender for me. It’s so beyond the realm of my intelligence that I can still laugh every time the balls collide and I lose. For a brief moment after all the gold coins are collected, both balls look slightly shattered and if you can maneuver them to collide in that brief window of time, then both balls forget their past paths and you get a clean slate for the upcoming coin collection, which is a bigger bonus than you realize until you play the game. The video below is a demo of a slightly earlier build of the game, but the premise is the same. The art is really simple, which I’m a sucker for. Warm tones and cartoon-y fonts give it all a whimsy feel, and I love that it doesn’t try to make it anything more than it is – a fun, simple game to play on your mobile device when you’re waiting in line. One piece of the puzzle I didn’t get at PAX due to the noisy exhibition hall was the music playing in the background. When I started playing it on my PC, I was pleasantly surprised by the warm strings and mid-range notes that guide you through the game. Very beautiful and soothing, a great addition to the experience. And perhaps best of all, when I stopped by at PAX to play this, the guys were so incredibly nice. I’m not sure which one of the gentleman I talked to, but he answered all of my questions, didn’t laugh at my abysmal lack of skills, and just seemed genuinely happy and enjoying the spotlight of the PAX10 (which with the high caliber of indie games that were there, is a huge and well-deserved accomplishment for Catch-22). More than the gameplay, the artwork, or the music, that makes me root for Catch-22 to be a roaring success. The game doesn’t have a release date yet (a couple of false dates are floating around on their Facebook page and website, but it is confirmed in Facebook comments that it isn’t available yet), but when it does come out it will be on iOS and Android platforms. To be even more awesome, the guys at Mango Down put out a completely free Facebook app version, found here! Great practice before the app officially releases for mobile devices. To play, just install the Unity web extension (which it will prompt you to do when you click the link) and wait for a not short amount of time for it to load. My high score is level 8, 25,087, which I’m proud of now but I feel like once you all start playing and commenting your high scores I’m going to be severely disappointed. Leave a comment, what’s your high score? Better yet, are you hooked already? Update: Hi to all the new readers! If I’ve convinced you stick around, consider liking the Little Sister Gaming Facebook page or following me at @littlesisgaming on Twitter to keep up on new posts. Thanks for visiting! I don’t think I should talk about Chris Kohler from Wired any more (Chris Kohler), but while I was waiting to talk to Chris Kohler, another aspiring games journalist/writer/designer like myself, named Ted, came up to me and took the panelists’ advice to network to heart much more directly than I did (and he is awesome for doing so). As we discussed our backgrounds (both English majors, from Washington, etc. ), his friend came up and Ted introduced me to Arian, a newly-minted tabletop game designer and indie developer himself. Even though Arian and his game Pocket-Tactics had just gotten picked up by Wired for investing in a 3D printer and taking care of all the manufacturing of the game himself, with the rest of his team at Ill Gotten Games (one of the best company names I’ve heard in awhile, I must say), he graciously agreed to meet up with me the next day, let me play through his game, and review it. I’m telling you, the nicest people go to PAX. On a Tuesday night some months ago, Arian had an idea for a dice-oriented tabletop game, inspired by the game play of Final Fantasy Tactics and its strategy game predecessors. By the end of the night, the idea was finalized and by Friday of that week, the first copy of the game was printed, painted, and fully playable. Not too shabby, by any standard. Its first iteration features two factions, the Legion of the High King and the Tribe of the Dark Forest. Each faction has strengths and weaknesses, so picking a side is a part of the strategy, not an arbitrary color or figurine preference. Arian said that there are more factions in the works to be released so players can have a wider variety to choose from. There are six classes per faction, ranging from strong melee characters to necromancers to archers. Each faction also has an accompany stats sheet so you can see each class’s defense and attack points for melee, ranged, and magic attacks. The stats sheets also show terrain advantages and abilities for each class. The most exciting part of the game to me was the map. Players take turn picking one hexagonal piece out of a small bag at a time and placing it around one player’s base. There are some placement rules that force players to build at least slightly outward. Each piece is painted and designed slightly differently to differentiate terrain types. Different factions will have benefits depending if they’re on a forest tile, a hill tile, etc. A different game play experience every time for a map-based tabletop game is a cool innovation, and I can only imagine how experienced players can use it to their advantage, or their opponent’s disadvantage. As a super noob, I didn’t really implement it myself, and I think Arian was too nice to just wipe the floor with me with that particular strategy. Each player only starts out with three figures on the board, which they get to choose, and more pieces can be added on subsequent turns but only to specific tiles near each players’ home base. The object of the game is to defeat the other player’s base, which in turn usually requires you to destroy all of their individual fighters. The base itself has 3 defense points, which means every attack against the base, the defending player can roll three blue dice. 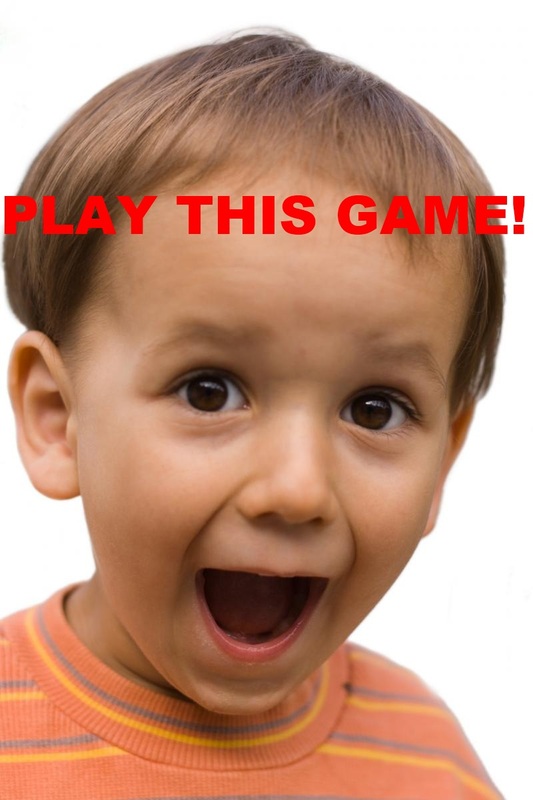 The attacking player uses 1 to 3 red dice (depending on how many attack points for that specific action that player’s figure has) and whichever player has a net total of higher dice either successfully defends or is defeated off the board entirely. The same process applies to attacking other figures as well (which have 1 to 3 defense points and can use 1 to 3 blue dice), not just bases. Each turn, a player can only move, spawn, or attack with one figure. There are more intricacies than that; I’m doing the game an injustice, just as I did the day I reviewed it when I had to do a rushed play through to get into a panel that was starting. The strengths of the game lie in the fact that I found it to be a pretty simple implementation of an advanced strategy. Figures get defense bonuses depending terrain and if allies are nearby, move bonuses for nearby allies, and disadvantages for standing on water map tiles. And yet in the quick thirty minutes I had with Arian to review this, I remembered all of that and I thought I was doing all right strategically during the short time we played. And maybe that’s the biggest point – Arian would probably be too nice to tell you if I was really blowing it anyway. I’m not trying to say that people should lie in favor of my skills (but it’s nice when they do) but I’m saying it’s really awesome to see good people like the team at Ill Gotten Games getting some coverage from Wired and some success for following their passions. 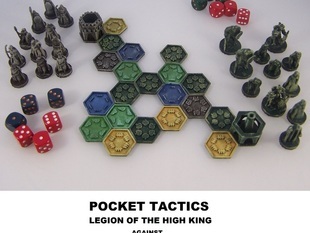 I love small companies and small projects to get big time coverage and success, so I’m happy to spread the word about a game that I will definitely buy, Pocket-Tactics. That opportunity to buy the game will be coming sooner than we think, Arian said that in the very near future a Kickstarter campaign is launching to raise funds to print Pocket-Tactics on a massive scale. I’ll be sure to post when that goes live so you can all get in on the fun earlier than the rest. And that might be the only downside to the game at the moment: while Ill Gotten Games may be printing the pieces, it remains to be seen who will be painting them, players or the manufacturers. It seems like it will depend on the success of the fundraiser; if it does well enough, we might be able to fund Arian painting board games pieces for fourteen hours a day until ship date, heh. Time, and the details of the campaign, will tell us. Ill Gotten Games’ other project is an RPG game, similar to the style of GURPS, but unfortunately we didn’t have time to delve into that too much. I hope the group has more games slated to release in the near future, if they can keep churning out fun and simple yet strategic games like Pocket-Tactics. For some reason, this seemed really funny to me at the time.